note: you should be pound of me, I basically repainted the LCD panel and viewfinder pic pixel by pixel. Can a basic manual focus learner's camera also have full automation? ____Testing the successor to the legendary Pentax K1000 was challenging. There weren't any difficulties checking lab findings against manufacturer's specifications or giving the camera a good workout in the field and lab. But the ZX-M represents a rare type of SLR that hasn't come under our test purview in recent years--a student's or learner's camera that might also prove attractive to advanced amateurs who hate automation, as did the K1000. ____We knew immediately that the ZX-M wasn't suitable for snapshooters. Lacking autofocus or a built-in flash, the ZX-M is definitely nor for them. Snapshooters would be far better served spending about $50 more for a Pentax ZX-50 with autofocus and flash goodies. ____And without AF or built-in, through-lens flash measuring, we don't think the ZX-M is right for average amateurs either. They, too, would be better off with the advanced features of the ZX-50, ZX-10, ZX-5n orPZ-1p. Convenient, precise manual metering and focusing --great for students. Fully automated exposure modes and film transport. Bright, clear, easy-to-focus viewfinder screen with good data readouts. Choice of many K-mount lenses in all price range. Keeping it all in the family:ZX-M body contours and control placement are similar to that of the ZX-5n and all other Pentaxes in the ZX line. Convenience: first rate. ZX-M innards same as top of line:Insides of ZX-M, bottom, are identical to ZX-5ns, top. Removable backs also interchangeable and accept accessory databacks. with metal focal-plane plate into which the camera engineers can pour more or fewer features depending on model, price, and type of user. It's surprising other camera companies haven't used such rationalizing, which cuts designing and engineering costs and should bring down the purchase prices well. The ZX-M has almost all of the outer construction and much of the innards that you get in the ZX-5n, the present top of the ZX line. ____Owners of ZX-Ms needn't undergo the puzzlement of learning how to punch electronic button controls as used in many other modern SLRs. The clearly marked, mechanically operated dials of the ZX series are easily understood. Controls move smoothly and are excellently positioned. The lightweight camera body is pleasantly handholdable in both horizontal and vertical positions. Is polycarbonate lensmount a detriment? While we wouldn't recommend plastic lensmounts for professional cameras, they hold up well on amateur models. We haven't heard a single complaint from any of the numerous owners of other plastic-lensmount SLRs. 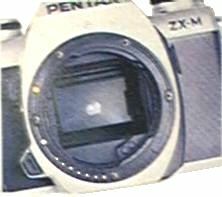 ____Although a polycarbonate lens mount does replace the stainless steel one used in other ZX cameras, and the dedicated flash system is non-TTL, the major salute to cost cutting in the ZX-M is the substitution of a pentamirror viewing system in place of the 5n's all-glass prism. However, the pentamirror is surprisingly efficient and, according to our tests, even brighter than the ZX-5n's finder! ____Viewfinder brightness, clarity, and focusing ability are often more important in a manual-focus SLR than in an autofocus camera. Owners of AF cameras generally use the crutch of autofocus automation most of the time, ignoring the alternative of manual focusing. ____Manual-focus-only SLR owners are totally dependent on the viewing screen for focusing and they often tend to be more critical in examining the picture area itself, right to the corners. ____The ZX-M 's finder has manual -focusing aids common to almost all pre-autofocus SLRs. To reach focus with the central split-image rangefinder, you line up the bottom of the split-circle image with the top. As with all good split-image rangefinders (and the ZX-M's is that), flagpoles and trees are subjects easily aligned. But many objects, such as faces, aren't. For them we have the ZX-M's outer microprism collar that fractures out-of-focus images and snaps them back into sharpness when focus is achieved. 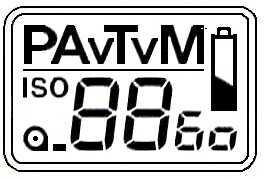 Pertinent data on small, top-side LCD panel: Auto and manual exposure modes, shutter- and aperture- priority, ISO film -loading status; all can be clearly undrstood. Panel info is almost identical to ZX-5n's! ____If you keep your eye carefully centered in the ZX-M finder, you can focus subjects at apertures as small as f/8 before the split-image and microprism darken too much--quite handy if you have lenses with limited maximum openings. This is a commendable performance since the focusing aids in many SLRs don't operate below f/5.6 The area outside the ZX-M microprism provides fine screen focusing right to the edges and corners--far snappier than the manual focusing in many autofocusing SLRs. And we were pleased with the easy-to-operate electronic depth-of-field preview-- a feature we think essential in any learner's or student's camera. ____In ZX tradition, a black information panel protrudes into the right-hand side of the viewing area. Why not has an information panel completely outside the picture area? Because the inside location makes it easier for eyeglass wearers to see and also provides more room for finder magnification. Panel information is almost identical to ZX-5n's except that it lacks an autofocusing signal. ____High marks go to the panel's excellent bar graph for manual-exposure-mode metering. While almost all other manual-focus SLRs use primitive red-green-red, three-diode metering systems in the finder to indicate correct exposure (green) and about 1EV error (red) on either side, the ZX-M offers a +_3EV scale with one-half EV indicators for more precise exposure control. Thanks to the protruding scale, metered manual settings are easy to see and control. ____But what exactly are you measuring with ZX-M's metering system? We were a little upset to find the camera used evaluative metering. With evaluative metering, the camera makes judicious exposure alterations depending on the illumination within the entire area. But a learner needs to be able to make his own specific camera settings without camera interference. However, the evaluative metering sensor at the back of the ZX-M's pentamirror has only two segments-- a central area and surrounding area. We found the system acted much like a centerweighted meter-- except in some instances where it did compensate slightly for some unusual lighting conditions away from the measured center area. The camera does switch to centerweighted if a lens without electronic contacts is fitted (see lensmounts info, facing page). Much like centerweighted metering:ZX-M's evaluative meter has two sensor segments for the center and outer area. These areas are measured separately, then analyzed together and used by the camera to calculate the right exposure level. 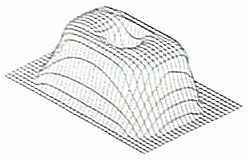 centerweighted metering pattern is biased for horizontal subjects, with a large non-metering band across top. This works well with horizontal shots and probably will not affect metering accuracy when camera is help vertically. ____The evaluative metering system produced a large percentage of well-exposed slides when metered from camera position, though we believe users will get an even better percentage marking close up readings of important pictures areas and determining exposures on their own-- the right approach for students and other learners. 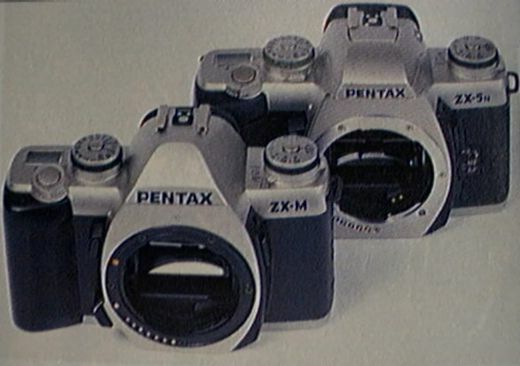 ____We wish Pentax had included spot metering in the ZX-M. It's a useful learning tool and the evaluative meter's center segment alone might well serve as a spot meter. ____Should the camera have had TTL flash metering? If convenience is the criterion, yes. Is TTL flash metering essential in a learning-tool camera? No. Learners will understand flash and distance ranges far better if they use numbers to manually set the proper apertures or use non-TTL automatic flash units. ____With flash units dedicated to Pentax cameras, the finder will provide a flash-ready signal, and in many Pentax-dedicated flash units, the camera's flash sync speed will be set automatically. ____While the ZX-M has neither a flash nor TTL flash-measuring built-in, much other exposure automation plus auto film handling is-excellent features that may however be shocking and (perhaps) near anathema for die-hard, do-it-yourself K1000 enthusiasts. This includes non-shiftable program, aperture- and shutter-priority autoexposure, autoexposure compensation, auto DX film setting, autoloading of film, autowind, and autorewind. No built-in or TTL flash, but...hot shoe is dedicated, will provide flash-ready signal and proper flash sync with many dedicated manual or non-TTL autoflash units. ____Why add all of this? Because a camera with features solely for learners and students might not be sufficiently salable. And there is another large group of prospective purchasers-- those who scorn autofocus but do want all the benefits of exposure automation. So the ZX-M's exposure automation modes may well entice them. Additionally, even learners and students might wish to have a go at exposure automation and perhaps shoot some snapshots in program mode-- manually focused, of course. ____While we can appreciate the pioneering spirit of photographers who for years have manually set their exposure indexes, loaded, wound, and rewound their cameras by hand, as in the K1000, we don't believe the ZX-M's automating of all these features is detrimental to photography. Picture-taking ability does not improve by manually inserting the film leader into the take up spool slot, remembering to set the ISO properly, and cranking the film through the camera by hand. TEST RESULT FROM OUR LABViewfinder:very bright and contrasty. Brightness lose only 1.7 stops, less than any other Pentax SLR recently tested. 0.77X magnification is good, screen image is 90% of picture area.Time between pushing the release button and exposure: 190 ms, normal for this class.Shutter speed: extremely accurate from 2 to 1/250 sec; provides less than 10% overexposure from 1/500 to 1/2000 sec. Exposure accuracy: Programmed AE mode; 1/3-stop underexposure from EV 2 to EV 6, very accurate from EV 7 to EV 15, 1/2-stop overexposure from EV 16 to EV 17. Shutter/aperture-priority modes: Very acuurate from EV2 to EV 15, 1/2-stop overexposure from EV 16 to EV 17. Sound level (in decibels at 0.5m, center position): Single mode: 63.4 average, 87.6 peak. Continuous mode: 64.7 average, 89.3 peak, with 50mm f1.7 lens. 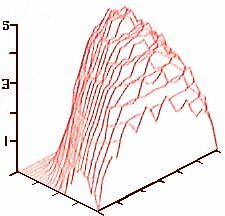 Very quite at average level for both single and continuous modes, and average at peak level. Rewind at peak level was 74 dB, very low. ____Many of us will always delight in admiring and cradling the angular contours of the comparatively heavy, metal-bodied K1000 and listening to the clockwork of its mechanical shutter. But the ZX-M does have it allover the K1000-- and over and other moderately priced, manual-focusing camera of any other makes as well-- in providing consistent shutter and exposure accuracy, satisfying the needs of the photo-learning curve, convenience, and swift operation. 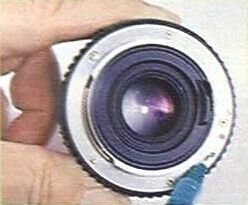 Manual focusing Pentax A and other brand lenses in Pentax mount: lenses with one or more electronic contacts at rear. Aperture and shutter speeds visible in all modes except no finder apertures in aperture-priority autoexposure. Read aperture from scale on lens itself. Evaluative metering. 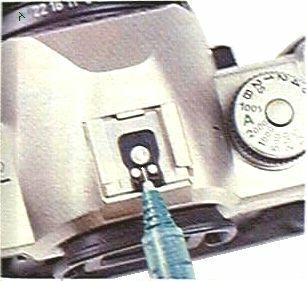 Make sure you have the right contact: Manual -focus Pentax-mount must have at least one rear electronic contact to provide ZX-M finder apertire info and evaluative metering. This is back contact of 50mm f/2 Pentax-A lens usually found on K1000. 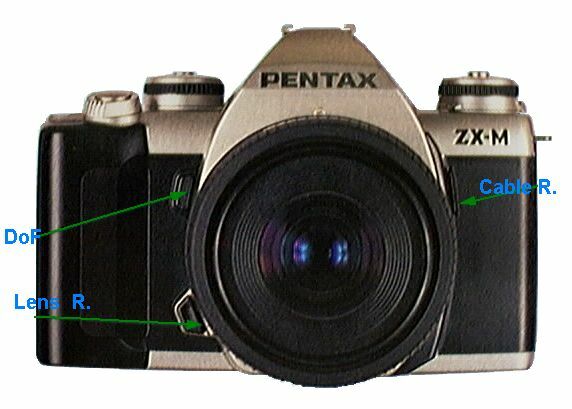 Manual-focusing Pentax and other brands with no electronic contacts: Aperture-priority and metered-manual modes only; apertures never visible in finder. You must read from lens. Centerweighted metering. Pentax and other brands of autofocusing Pentax-mount lenses: Aperture and shutter speeds visible in all modes. Evaluative metering. Editors' choice: AF Pentax lenses give you all modes and info, but are more expensive than manual-focus lenses. Still, if you plan to buy an AF Pentax and you can get a good buy on AF lenses, that might be the way to go. ____There's a Pop Photo's "First Look"of ZX-M in their Januray 1998 issue. It's really nothing new there, but you can read it if you are interested in Pop Photo's format. 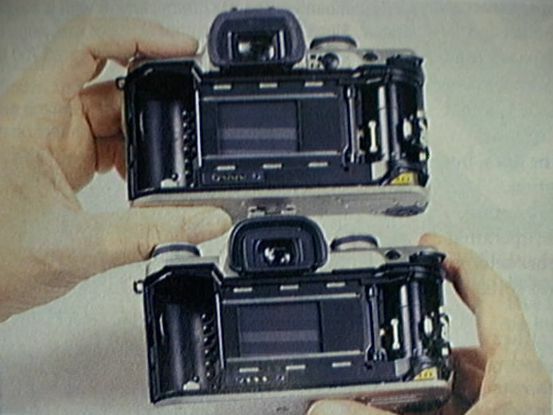 The camera was offically introduced in Oct 97's Photokina.